Happy October, friends! I hope you’re all enjoying as much apple pie and pumpkin things as possible. 😉 Today, we’re talking about September’s income and sharing a behind the scenes of the business side of Jar Of Lemons! If you’ve ever wondered how a food blogger makes money, are wanting to grow your traffic, or maybe even start a blog, these monthly blog income reports have tons of resources and tips. You can check out why we started these income reports in our first one (Monthly Blog Income Report – April 2017)! As a reminder, these monthly blog income reports are NOT about the money, but are instead a way for us to share how we’re reaching our goals as a business and what we’re doing to grow. They’re a way for us to be transparent with you guys in order to (hopefully) help you achieve your blogging goals! If you have any questions or thoughts, be sure to let us know in the comments below (or email us over on the contact page). We want these reports to be helpful to you guys! Please note that some of the links below are affiliate links. These are products that I’ve used before and stand behind! As we’re entering the fourth quarter for the year, the income from sponsored posts will (likely) increase through December. Typically, it then drops back down in January! 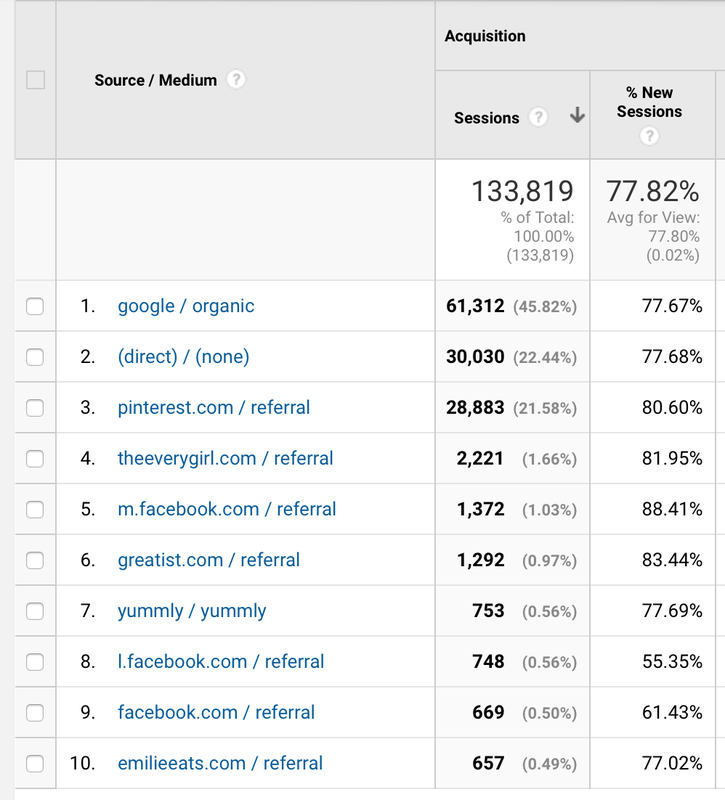 This month, traffic increased slightly from last month’s report. A leveling in traffic is typically expected around this time of year for Jar Of Lemons, since healthy recipes just aren’t as popular as splurgy holiday recipes during these last month’s of the year. We totally get it! 😉 We try balance things out by including lots of holiday recipes with a healthy twist, but the real increase in traffic comes in January when everyone’s looking to get back into shape! Although this is our favorite time of year and we’re LOVING making delicious fall recipes, this is really a time for us to take a step back and look at how we want to approach the new year. That’s always a great time for us to really push the blog and grow our community! Since our traffic kind of levels out around this time of the year anyway, we’re focusing on pulling back on how many times we post each week and using that time to really plan for our big push in January. Side note, if you’re looking for a great way to improve your photography skills, we highly highly highly recommend joining Food Blogger Pro and taking their photography courses! >>Here’s how this applies to YOUR blog! As you’re thinking about your blog and this time of year, think about when that “peak” time might be! Is it the holidays? Is it the new year? How can you focus on creating a big “push” for your peak season? Focusing on peak seasons during the low traffic season are a great way to optimize content and workflow! Cody’s taking a break from his section from this month’s report (see last month’s report) due to the kitchen renovation. He’s working so hard to get that project done by Thanksgiving! So instead, I (Christine) thought we could chat blog stuff instead! What’s an area you’re wanting to grow your blog in this month? What’s an area you’re seeing success in? What’s a struggle or an area you feel stuck in? What’s a way that you can push your peak season? How can we help YOU with your blog? We love our blogging community! And we’d love to share what we’ve learned with you guys (and vice versa). If you have questions or thoughts on this month’s report, be sure to comment below! Thanks, Bjork! We love FBP! Thank you for this!! I love your site! My blog is about a year and half old so it’s wonderful to have a blogger community that I can learn from . Looking forward to 2018 goals!